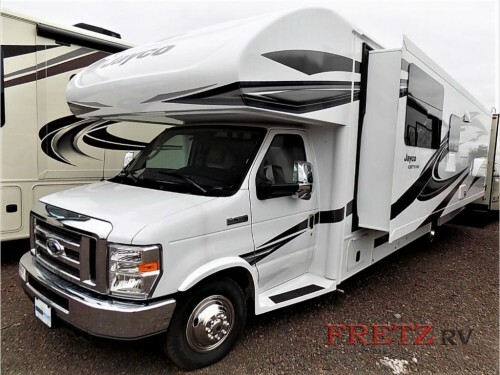 The Jayco Greyhawk Class C motorhomes for sale here at Fretz RV are built to make every part of RVing better. Whether it is when you are driving or have reached your destination, each of the five floorplans will feature plenty of luxury and comfort amenities for your enjoyment. Take a closer look in this Jayco Greyhawk motorhome review and see everything you can bring along for your next RVing vacation. Check out our Jayco Greyhawk Class C Motorhomes! With a motorhome like the Jayco Greyhawk, you are getting a home as well as a mode of transportation, so it is designed to help you travel every mile in comfort. With the exclusive JRide Plus system, the computer balanced driveshaft, stabilizer bars, Bilstein shocks, and more will create a safe and smooth ride. 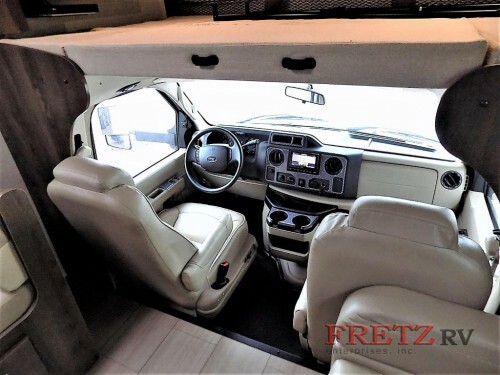 Plus, the interior with its Jayco exclusive Garmin Infotainment system, backup and side-view cameras, and remote-controlled, heated side-view mirrors will help guide you and keep every part of the RV safe by giving you more eyes on every side. The infotainment center, JRide Plus Package, and more make every mile better. 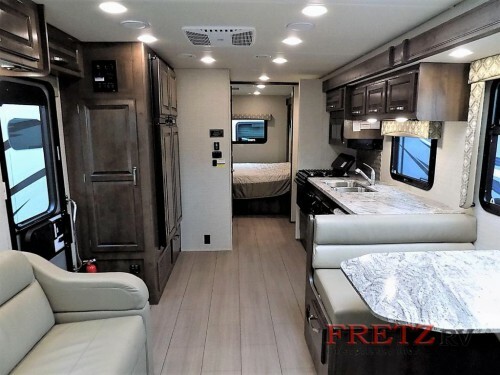 No matter the size of your family, the Greyhawk motorhome will come in a floorplan that fits everyone with some options featuring enough space to sleep up to seven people. Each model will have a queen master bed, over cab bunk, and convertible furniture including a Dream Dinette with easy raise and lower tabletop mechanism, and for larger groups, you can find options with a set of bunk beds. So everyone can have a spot to call their own each and every night. Spacious interiors makes room for everything and everyone! Class C motorhomes are popular because their compact size makes them easy to drive, but these Jayco models will have one to two slide to provide room for everything once you have parked. The full kitchen comes with enough room for a double door fridge, 3-burner range with Super Burner, and more, so cooking will be a breeze. Plus, with cable and satellite LED TVs in both the bedroom and main living area, you can enjoy entertainment in every room to make it truly feel like home. All of this and more comes with each of our Jayco Greyhawk Class C motorhomes. So if you are ready to start living the RVing lifestyle, contact us or come down to our location today!